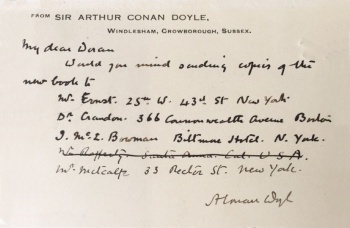 This letter was written by Arthur Conan Doyle on 23 march 1930 from Windlesham, Crowborough, Sussex, to George H. Doran, Madison Avenue, New York, USA, the publisher of George H. Doran Co..
J. Mc. E. Bowman Baltimore Hotel, N. York. Mr. Rafferty. 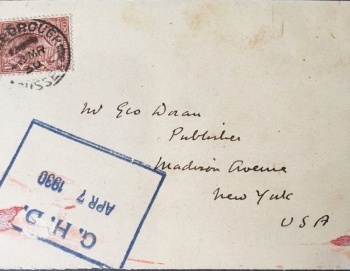 Santa Anna, Cal., U S A.
Mr. Metcalfe, 33 Rector St. New York. This page was last edited on 16 November 2017, at 01:07.